A woman was killed Thursday morning when a driver carrying a load of broccoli likely went too fast around a curve, lost control and his trailer fell onto her Toyota, according to the California Highway Patrol. Officer DJ Sarabia said the woman, in her 40s, died at the scene -- Interstate Highway 680 at McKee Road in San Jose. The driver of her Toyota Camry was taken to the hospital with minor injuries, Sarabia said. The driver of the PCC Logistics big rig, a man in his 30s, was taken to another hospital with critical injuries, Sarabia said. Milpitas fire crews who spotted the accident just before 10 a.m. were on hand to help pull him out, Sarabia said. 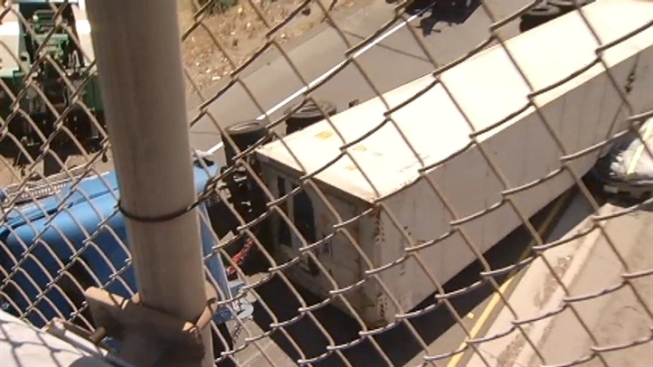 Sarabia said that the preliminary reports show that the big rig driver was likely going too fast around a cloverleaf turn as he was getting onto northbound 680. As he took the curve, Sarabia said the big rig driver's trailer fell onto the Toyota Camry with two women inside. The broccoli did not fall out of the truck. The highway near the accident scene was expected to be closed until 1p.m. Contact Lisa Fernandez at 408-432-4758 or lisa.fernandez@nbcuni.com. Follow her at Twitter.com/ljfernandez.